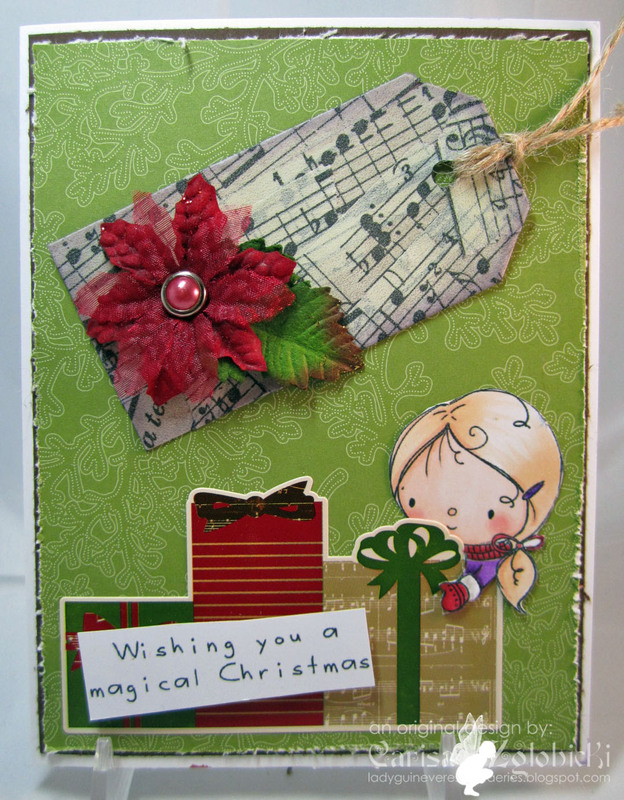 Inky Fairy Designs: A Magical Christmas Recipe! Hi all you PWCO fans! I hope everyone had a wonderful Christmas & holiday season - mine was pretty much a whirlwind!! It was definately magical though with my girls ages 5 & 3 and my son celebrating his first Christmas at 9 months. He was pretty much oblivious to it all but my girls - wow, if I could make time stand still....they were both just such a joy to watch. Our recipe this week is to use 2 papers, 1 flower & a tag! At first I was kind of thrown for a loop with that combo, but my 3 yo really inspired this card. I thought it would be cute to cut out A Magical Christmas and put her hiding behind the gifts as if she just can't wait to get to unwrapping that paper to see what is waiting for her inside! I used some misc paper from my stash along with some of my Echo Park Christmas paper - I forget exactly which line it is. 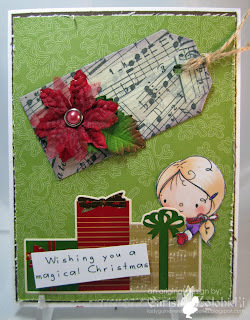 Then for my tag, I wrapped a plain kraft tag with Tim Holtz tissue tape in different angles. Then distressed the edges in purple & added my poinsetta flower on top. I love how it turned out! Def love the tissue tape effect on the tag. Very fun to do. Be sure to check out Paperworks Co Blog for more details and to join me in this week's recipe challenge! tooo cute! Hope you had a fabulous Christmas! WAs Trey into the wrapping paper? FWF - Sorry I'm late! My Top 10 Cards of 2010! Happy Friday Friends with Flair! A Jolly Tilda Christmas Card! Anyone for Anya - Color Challenge! Paperworks Company Design Team Announcement! FWF - 80 Baby Announcements, Oh MY! Guest Designer for a Day - Can I get a Hip Hop? !